The story began in 1994 on the bank of the River Ob amidst the endless expanses of the Siberian taiga. The well-known Siberian entrepreneur Vladimir Megre met with two elderly gentlemen who told him about the amazing properties of the Siberian cedar (also known in the West as the Siberian pine ). At first he didn't pay much attention to what they told him, but as he continued to reflect on it, Vladimir began to discover, in the historical and scientific literature he examined, more and more evidence supporting their words. Finally he decided to organize an expedition with a fleet of river steamers. The expedition was ostensibly for commercial purposes, but in actual fact his overriding motivation was to find the elders again and learn more about the secrets of the cedar. Having instructed his fleet's captain to maintain their course, Vladimir slipped away by himself at the exact spot where he had met the two elders the previous year. On the riverbank he found a woman waiting for him who turned out to be their granddaughter. She called herself Anastasia . This woman, through the depth of her knowledge, her sincere love and her outlook on the world, was to have a profound influence on Vladimir 's whole life. At first he saw her simply as a young attractive woman who, though she appeared quite knowledgeable about modern urban society, seemed to be utterly naive in her aspirations to change that society from her remote location far off in the wilds of Siberia. Later, however, Vladimir came face to face with certain psychic abilities of Anastasia's which defied explanation, even though they were undeniably real to his perception � inexplicably manifesting themselves in a tragic struggle of virtue against vice which unfolded before his very eyes. He was shaken by scenes somehow presented to him from his not-too-distant past, but from a totally new point of view. Now able to look at his own and others' behaviour more objectively, Vladimir gained a new appreciation of what Anastasia was endeavouring to do, and in an effort to help, he promised to fulfil Anastasia's request and write a book about his experiences. Upon returning to his home in Novosibirsk , Vladimir made a series of unsuccessful attempts to spread this new outlook on the world among his friends. He went to Moscow and tried to organize a league of pure-minded entrepreneurs � again without success. Finding himself on the edge of an abyss, he finally remembered his promise to Anastasia to write a book, along with her assurance that the book would help many people see the world in a new light and give him the strength to go forward. Then something incredible happened: without any specialised training, Vladimir Megre launched into writing a series of books which in a very short time became extraordinarily popular, selling in the millions, and would be translated into some twenty languages. Each passing day introduced more and more new readers all over the world to these remarkable writings. The books set forth � in very clear language � profound ideas about the education of children and the importance of communicating with living Nature � ideas ranging from nutrition and health to spirituality and sexual relations. With their practical wisdom on matters of everyday life, the books have become the basis for a number of sociological studies and scholarly papers. We take pleasure in recommending them to the broadest possible readership. 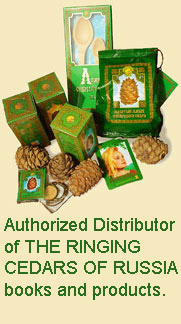 Official Distributor of THE RINGING CEDARS OF RUSSIA. For more information on the book and their availability in English, see Books section of this web-site.